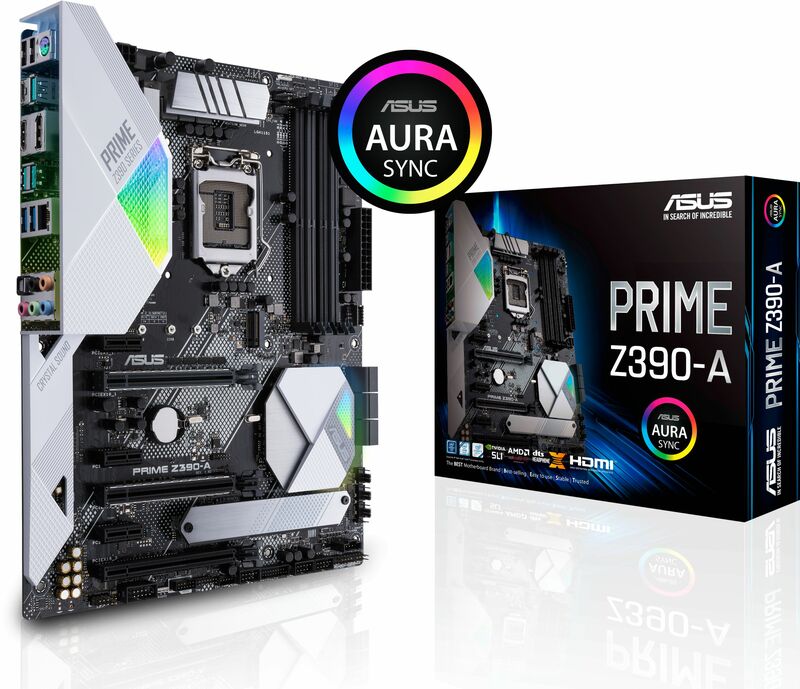 The ASUS PRIME Z390-A motherboard supports 8th and 9th Generation Intel Core processors in the LGA1151 package. It has two 32GB/s M.2 slots, onboard Intel Gigabit LAN, DDR4 support and DisplayPort and HDMI outputs. Dressed in professional attire, the Prime Z390 series caters to daily users and content creators with well-rounded specs and features. Combining the benefits of the latest processors with essential ASUS design and engineering, Prime Z390 provides a wealth of options for performance tuning via intuitive software and firmware features. 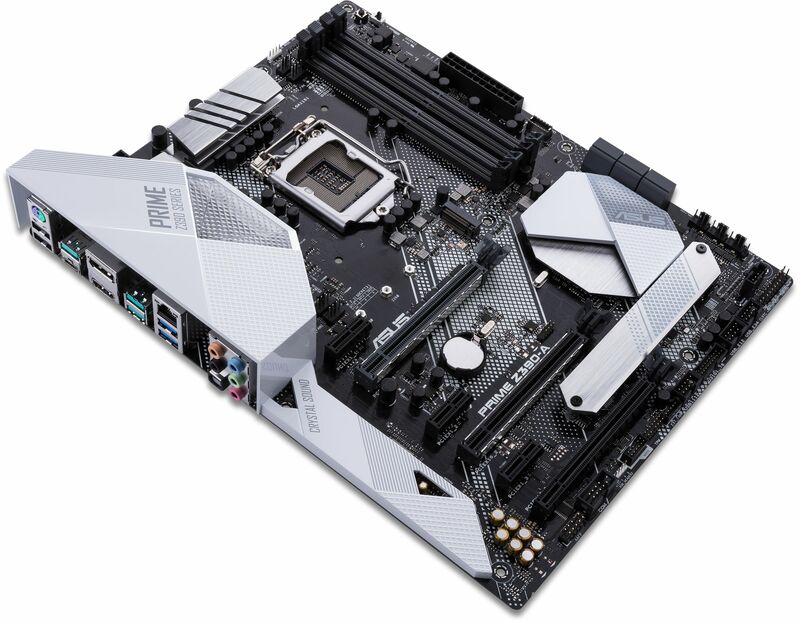 Prime Z390 simplifies CPU overclocking with software and extensive tweaking options that give beginners and seasoned overclockers alike the tools to build well-tuned machines. A new memory trace layout provides stability and compatibility for both traditional DIMMs and RGB-infused memory, letting you pair a broad choice of DRAM kits with your build. ASUS AI Overclocking makes automatic tuning faster and smarter than ever before. Available in Windows or directly through the UEFI, it profiles the CPU and cooling to predict the optimal configuration for each individual system. With backward-compatible USB 3.1 Gen 2 Type-A and reversible USB 3.1 Gen 2 Type-C ports, you'll experience ultimate connection flexibility and blazing data-transfer speeds of up to 10Gbps. Take care of complex tuning with just one click. ASUS 5-Way Optimisation is a system-wide tuning utility that overclocks the processor and tunes fan speeds to ensure the best balance between cooling and acoustics. The automated CPU tuning feature of 5-Way Optimisation leverages the same onboard intelligence as AI Overclocking, but goes further by running a Prime95 based stress test to deliver a result that's well-tuned from the get-go. The UEFI BIOS is an early waypoint on any PC-building journey, and Prime Z390-A offers one of the best in the business. To provide Intel's latest processors unfettered access to memory bandwidth, we've reimagined motherboard trace routing from the ground up. ASUS OptiMem II tech carefully maps memory signal pathways across different PCB layers to reduce vias and also adds shielding zones that significantly reduce crosstalk. And to further enhance overclocking headroom for fully stacked memory configurations, we've employed a highly customised T-Topology layout that delivers time-aligned signalling. Prime Z390-A features the most comprehensive cooling controls ever, configurable via Fan Xpert 4 or the UEFI BIOS. A well-tuned enthusiast system deserves a matching aesthetic. ASUS Aura offers full RGB lighting control with a variety of functional presets for the built-in RGB LEDs as well as strips connected to the onboard RGB headers. And it can all be synced with an ever-growing portfolio of Aura-capable ASUS hardware.